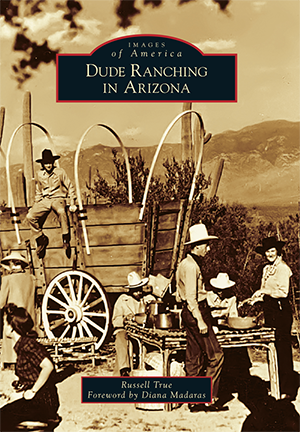 Dude ranches were Arizona's first destination vacation. The earliest were built on working cattle ranches, stage stops, mining claims, and homesteads. Early dudes were typically wealthy and stayed for a long time, some for so long that one ranch had a school for its guests' children. Dude ranches were built around unspoiled country and offered spectacular views, "healthy" weather, and the chance to experience the cowboy life. Hollywood filmmakers came and, with them, some of the biggest figures of their time. Among those who were guests at dude ranches were John Wayne, Gary Cooper, Clark Gable, Katherine Hepburn, Spencer Tracy, Dean Martin, Tom Hanks, Walt Disney, and US presidents. When he was five years old, Russell True was brought to his family's ranch in 1965. As a child, he watched his parents work tirelessly, and after helping on the ranch, Russell began his career in 1982. He celebrated 50 years in dude ranching in 2015 at White Stallion Ranch. He was cofounder and president of the Arizona Dude Ranch Association and has twice been president of the Dude Ranchers' Association, the only multistate dude ranch group, founded in 1926.